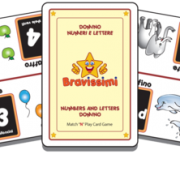 By playing Bravissimi Numbers and Letters Domino young children improve their memory, learn to recognise patterns, count, better their concentration and, in this case, their Italian language skills. 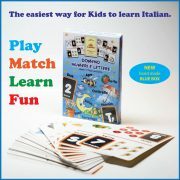 THE EASIEST WAY FOR KIDS TO LEARN ITALIAN!!! 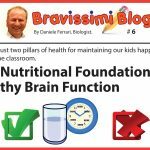 Memorizing things is a part of life, and a domino is an ideal game to play with kids, because the rules are simple. 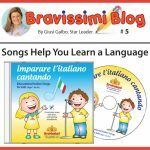 By playing Bravissimi Numbers and Letters Domino young children improve their memory, learn to recognise patterns, count, better their concentration and, in this case, their Italian language skills. 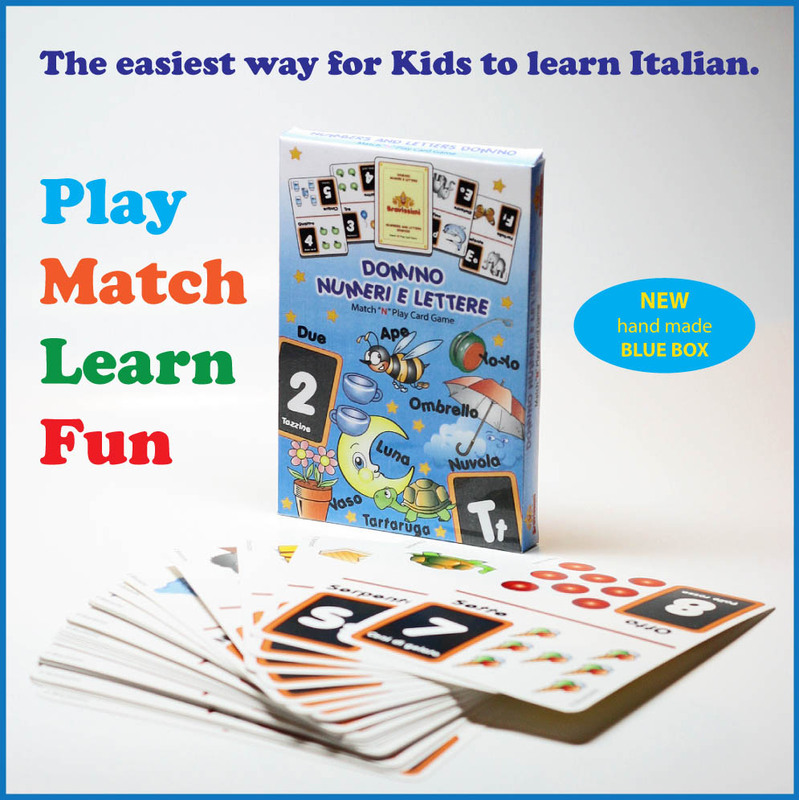 This Domino game is a great way to build the skills that children require for pre-school leading to elementary school, it’s fun, colourful and makes learning easy! 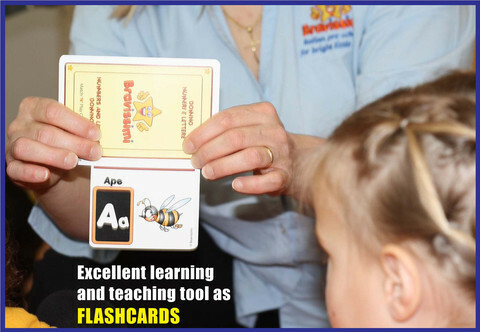 Individual: Start by placing one card on the table, find and match the corresponding letter or number. Continue until all cards are matched. For 2 to 4 players: Equally divide the 36 playing cardsbetween each player. Decide who will begin the game. The first player will lay a card of his choice on the table and, clockwise, the player that has the matching card will add to that card. If a player has additional cards to add he or she can do so. If the player does not have any matching cards it will be the following players turn. 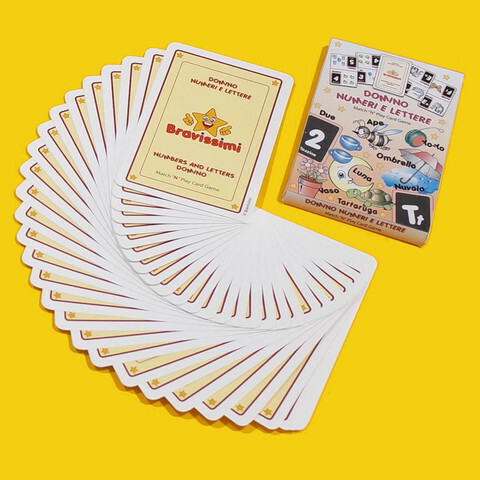 The player who is first to finish all their cards wins. If you wish to play with points: Once a game has finished, the remaining players that are left with cards will record the amount of cards left in their hand (one card = one point). Once you reach 10 points you are out of the game. The game continues until there is one player left with the least amount of points. 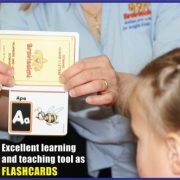 Excellent learning and teaching tool as FLASHCARDSespecially when introducing new vocabulary or drilling familiar words.